Two documentaries by Mark Rappaport reach DVD in the UK for the first time with the Bounty Films’ releases of Rock Hudson’s Home Movies & The Silver Screen: Color Me Lavender. The first, Rock Hudson’s Home Movies, is something of an experiment from Rappaport, as he creates a collage of clips from Rock Hudson’s cinematic output with actor Eric Farr as Rock Hudson providing narration for the clips speaking in something approaching the first person. This quasi-documentary approach is an interesting one to watch but it is nowhere near as successful in practice as it needs to be. Whilst the form letting the content down could be just a minor problem, the weak content results in the form actually failing to bring life to the highly disappointing content. Rappaport’s discussion piece surrounding the duality in Hudson’s on screen heterosexual roles and his off screen homosexual life does little to illuminate either and in some cases his attempts to use clips to discuss such things as Hudson’s death from an AIDs related illness feel tasteless and exploitative at worst, and just silly at best. The Silver Screen: Color Me Lavender is less experimental but is still very much a continuation of the groundwork that Rappaport laid with Rock Hudson’s Home Movies. This time Rappaport tackles a far wider subject, that of homosexuality in the “Golden Years” of Hollywood. The clips this time come from a wider selection of films and the narration is provided out of character (although often in costume) by actor Dan Butler. The choice to use Butler is an interesting one as he is a reasonably well known gay actor probably most famous for his portrayal of an extreme, stereotyped heterosexual male in the television series Frasier. Butler is engaging and humorous and his presenting of the essay-like script does a lot with little, managing to make even the most clumsily phrased sentences sound almost natural. Perhaps the greatest problem Rappaport faces with Color Me Lavender though is The Celluloid Closet, a film that preceded Color Me Lavender by two years and covers a lot of the same topics and uses a number of similar clips. Directed by Rob Epstein and Jeffrey Friedman, The Celluloid Closet was based on the book of the same by Vito Russo and as a documentary on this subject it is hard to top. Wide in scope but concise in delivery, The Celluloid Closet calls on a number of experts to deliver an informative but often heartbreaking account of the impact that positive and negative homosexual representations had and the way in which they worked within the context of Hollywood. An essential watch, it sets the bar high for anyone who hopes to tread in similar territory. Color Me Lavendor just pales in comparison, failing to deliver an informative account and often resorting to some pretty simplistic subtextual readings. Rappaort’s approach to humour in Color Me Lavender also grates somewhat and lines such as “Sometimes a cigar is just a good smoke.” followed by “Sometimes a cigar is more than just a cigar.” just fall flat and add very little to the discussion. Both documentaries from Rappaport are to some extent noble endeavours but their failings are far too great to make them essential, especially in light of the excellent work done elsewhere on similar subjects by more accomplished filmmakers. The DVDs from Bounty Films have poor picture quality and sound but this is inherent to the source material (Rappaport used VHS copies and recordings from television in places) and the DVDs themselves are not at fault in anyway, they merely present the films as they were made. The DVDs each include a supplemental Rappaport short film with ‘Blue Streak’ included with Rock Hudson’s Home Movies and ‘John Garfield’ accompanying Color Me Lavender. The former feels very much like a student effort and the attempts to be provocative come across as a little laughable now. The latter though is excellent and by far the best thing on either of these discs. Essentially a direct profile of blacklisted actor John Garfield, Rappaport tells a concise and fascinating story through voiceover and clips. 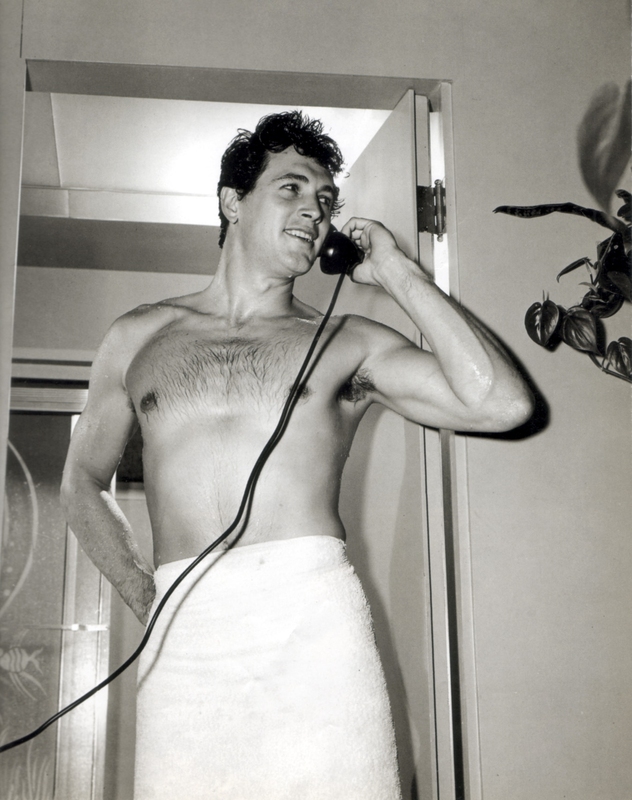 Rock Hudson’s Home Movies and Color Me Lavender are both available to buy or rent from the 1st of August.